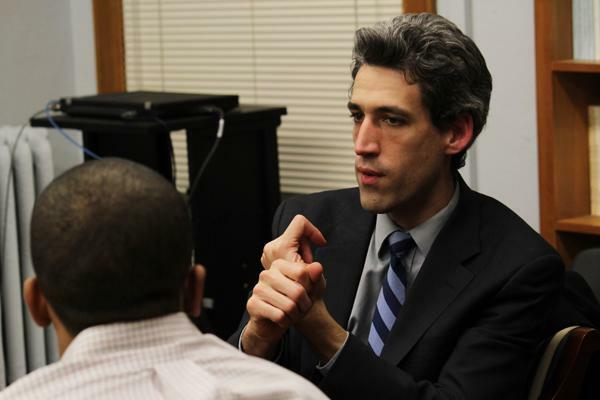 State Sen. Daniel Biss (D-Evanston) speaks earlier this month at Northwestern's Political Union. Biss has proposed a bill to reform Illinois' pension system that may see a vote on Tuesday. The Illinois General Assembly may vote Tuesday on three bills to repair the state’s broken pension system, including one proposed by Sen. Daniel Biss of Evanston. Illinois faces a $95 billion deficit in unfunded liabilities, and state lawmakers have been at loggerheads over how to deal with the worst-in-the-nation pension debt. Biss, a Democrat, has put forward Senate Bill 35, which he says would cut nearly $30 billion from the pension shortfall by capping cost-of-living adjustments (COLAs) at 3 percent for some state workers. COLAs are year-to-year changes in retirement benefits that depend on how expensive it is to live somewhere in Illinois. The assembly’s pension committee debated Biss’ bill and two others last week. All three propose increasing employee contributions, raising the retirement age and curbing COLAs. Senate President John Cullerton (D-Chicago) has proposed Senate Bill 1, which hedges against the possibility that limiting COLAs may be ruled unconstitutional. The second part of the legislation gives employees a choice to accept reductions to COLA payments or lose state-funded health insurance in retirement. House Bill 3411, which includes components of Biss’ bill, was approved by a House committee and is awaiting a final vote on the House floor. The bill, written by Rep. Elaine Nekritz (D-Des Plaines) and House Minority Leader Tom Cross (R-Oswego), has bipartisan support from 32 sponsors.